If you've been following digital publishing news for more than 20 minutes then you probably know that the Kindle Store has the biggest market share of the global ebook market. And if you've been following digital publishing news for long enough you may have also heard someone say that Amazon doesn't dominate every market nearly as well as well as in the US. Kobo, for example, has a larger share in Canada, and it's been said that Amazon's share of ebook markets outside of Europe and the US is actually negligible. I didn't realize quite how true the second statement was until today. A friend on Twitter forwarded some data to me today, and it raises some serious questions about just how thoroughly Amazon dominates the global ebook market. The following image is a screenshot taken of the publisher's portal on backstage.immaterial.fr. It shows the sources and relative proportions of one French publisher's revenue. This chart should not be taken as canon for the global ebook market nor even the French ebook market. It only reflects the revenue of one publisher, but it is sufficiently different from the common assumption that Amazon dominates the global ebook market that I thought it worth sharing. As you can see in the screen shot, this French publisher is earning nearly as much from Kobo/Fnac as from Amazon, with iBooks coming in a not too distant third place. Amazon in fact accounts for less than a third of this pie chart. That is incredibly different from the 60% figure that everyone throws around, and it raises the question of whether we should be mentioning that 60% figure any more. I for one think we might want to take it with a grain of salt. We might even go so far as to question whether Amazon really has 60% of the global ebook market. Nah, that's just crazy talk. TBH, I have been hearing for some time now that Amazon didn't dominate all markets, but this is the very first time that I have seen real data to back up that idea. And while this is but a single data point in a single small ebook market, it reveals a view of the market that is very different from what a lot of pundits are saying. And for that reason, I am sharing this screen shot. If this blew your mind as much as it did mine, you're welcome. P.S. If anyone has similar data to share about the US, global, or other ebook markets, please send me an email. I can keep a secret. Apple’s 19% most surprises me. The site looks a little difficult to navigate, even when I translate the page using Chrome. I’m wondering how authors would get their books on the site. Maybe I’ll have to contact them. I sell a couple titles in France each month so this could be beneficial. The 60% figure has always been for the US. Yes, but it’s also the only really solid info available so it keeps being passed around. As you rightly say, Nate, this chart should not be considered representative of, well, anything. First of all, for the time being, the ebook market in France is insignificant. Figures from March (http://www.actualitte.com/usages/ebooks-le-marche-francais-estime-a-0-6-des-ventes-de-livres-41139.htm) may show an 80% progression in ebook sales in the country, but that still only represents 0.6% of all book sales in the country. The most interesting part of the pie chart, for me, is the slice that goes to Kobo. In France, Kobo made the very smart move of partnering with the FNAC, which is the country’s largest bookstore chain. So, if ebooks are ever to really take off in France, and the FNAC doesn’t mess things up, then Kobo has a real chance of dominating the market. In any case, the French book market is really not like anywhere else. There are laws protecting the price of books, attempts at state aid for independent books stores, an incredibly innovative (although sometimes oddly off-target) way of trying to do everything “the French way,” and a very French tradition of being behind until the French suddenly, surprisingly jump ahead (http://www.pbs.org/mediashift/2013/03/are-the-french-preparing-an-e-book-revolution-mais-oui084/). So, there really is no way to extrapolate to the world market. The famous french “unique book price” also applies to ebooks. No dumping there, no price wars for books in french language. Furthermore, the biggest alternative to the Kindle, the FNAC Kobo, is sold in brick and mortar stores, and in FNAC online store. FNAC is a really big retailer in France. But I would not think of these numbers as meaningful. The French ebook market is still a budding market, and ebooks are by no way cheap, here. The publisher controller prices means that they can keep ebooks prices artificially high to slow down even more ebook adoption. This is something widely known in Europe, but sometimes new in the US : no, the Kindle is not smashing competition outside the UK. The situation is very different in other European countries. First we have to be careful, there are no official data, and Numeriklivres who you refer to, is a (very) small digital-only publisher. As you write, this is just an example, not the market figures. In France, it’s indeed a 3-players market, with the Kindle, iBookstore & Kobo who partners with Fnac, the country largest physical bookstores network. They are close to each other and based on the publisher, the ranking will be different. A high level executive of Hachette France, the market leader, told me recently that for them the iBookstore was leading the race, just above Kindle and Kobo/Fnac a bit further behind. The global trend was that the iBookstore had been #1 for a while, but that the Kindle is catching up this year and it’s pretty balanced right now, Kindle being a higher in fiction and backlist titles, and the iBookstore on new hits, genre, illustrated & nonfiction. Kobo/Fnac who had a strong peak just after Christmas, due to the high number of devices sold in the Fnac stores, seems to have slowed down in the past 6 months. In Europe, the situation fluctuates depending on the countries. Kobo is almost nonexistent in Germany (lack of local partner) or in the UK, but doing good in Italy through Mondadori, and so-so in the Netherlands where their Libris partnership is not as successful as they expected. In Germany the local Weltbild is a very strong competitor too. The iBookstore is also doing much better than in the US, being very close to Amazon in most countries & leading a couple of them. Keep in mind too that Apple is in 30 countries in Europe, while Amazon is just in 5 (UK, Germany, France, Italy, Spain), so the iBookstore is often the only solution in all others, and we are talking about a market of 150+ million people (Eastern Europe + Scandinavia + Benelux…). Amazon face a strong competition in non-English speaking markets (same as in Asia & South-America it seems). #Vincent, je pense que vous avez une grande méconnaissance de qui sont les Éditions Numeriklivres et dans l’édition numérique, c’est loin d’être un petit éditeur comme vous l’affirmer. Je vous invite à lire d’ailleurs ce billet qui témoignent aussi d’un certain souci de transparence de la part d’un éditeur, ce qui est très rare . Je suis toujours surpris de voir que beaucoup de gens sur le Web ont des avis sur tout mais finalement ne sont experts de rien. Well, sure. Kobo is way more popular internationally than it is in the US. I wouldn’t be surprised to learn that Kobo’s market share is greater than Amazon’s in Canada, for example. But from what I’ve heard, the US is the largest ebook market (though China may be close. China’s always pretty big, and Kobo/Rakuten serves that market well). And Amazon is the dominant player in the US. Outside the US, that dominance doesn’t seem so great. I think it’s actually one of the big reasons the new Paperwhite has Amazon on the back, and not Kindle. Bezos is on record as having said that’s a branding decision for international markets; more people know and trust the Amazon brand worldwide than they do the Kindle brand, and even a minor change like that is part of a strategy to increase marketshare. 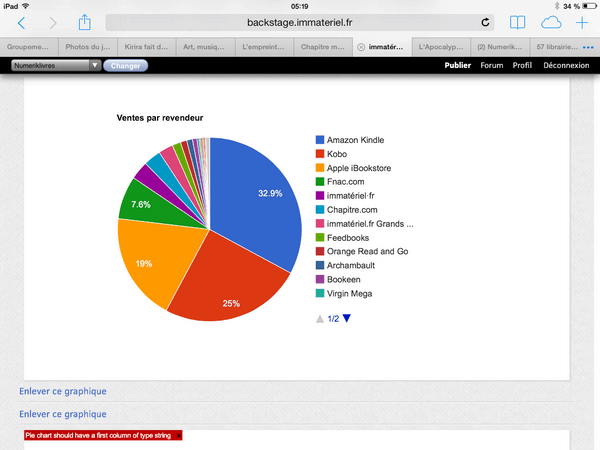 I was at a conference in Italy last weekend and a French publisher I was chatting to reckoned the French (trade) e-market split roughly 40/40/20 between Amazon/Apple/the rest – with Kobo/Fnac grabbing most of the latter. We’ve been going Kindle-exclusive for a while now in order to participate in Kindle Select. However, based on some of the international Kobo stats (particularly Canada and their apparently good servicing of the China market) we’re beginning to experiment with Kobo for select titles. Up until about a year ago we were publishing titles on Nook as well as Kindle, but found the Nook revenue stream to be negligible compared to the borrowing option payout under Kindle Select. Of course, that’s just our experience. I’m REALLY hoping Kobo revenue turns out to be worthwhile compared to Kindle Select borrowing revenue, because I’d REALLY not like for us, or our industry, to be Amazon dependent in the longterm when it comes to eBooks.